Many young people LOVE travelling. At the same time their schedule is packed because of working and/or studying, personal life, socialising, sport activities and many others. 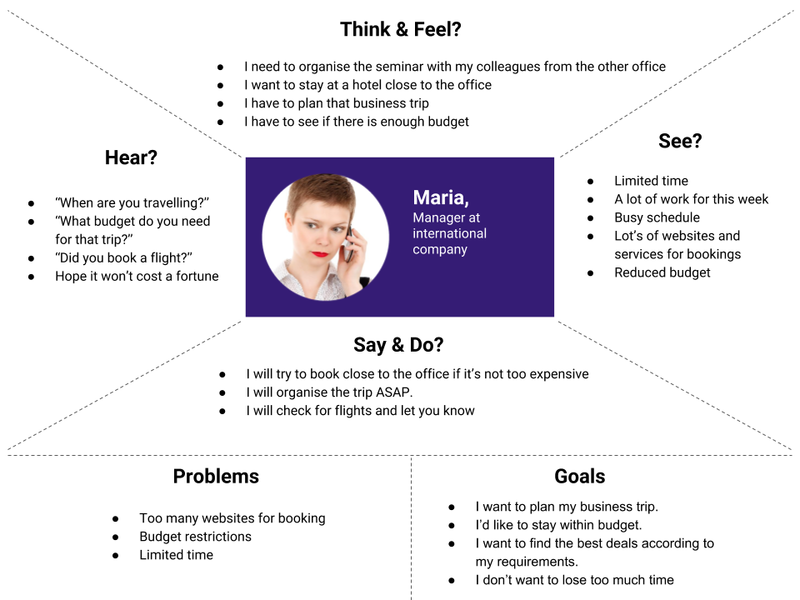 While there are many different services and websites that can help organise your trip, it is still a very time consuming activity. 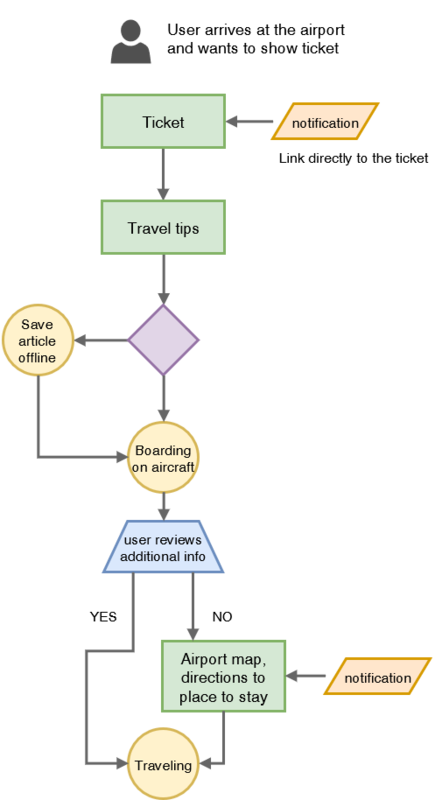 There is the need of an integrated service with which the user can easily book flight tickets, transportation, place to stay, plan what to see and do and all things travel related. And here comes Tripio to the rescue. 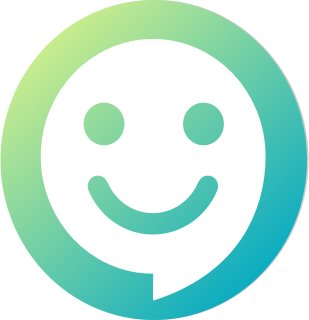 The friendly chat bot who is here to answer all you travel related (and some other) questions, to help you book tickets and accommodation, save all your itineraries, remind you of important stuff and keep everything organised, nice and easy. 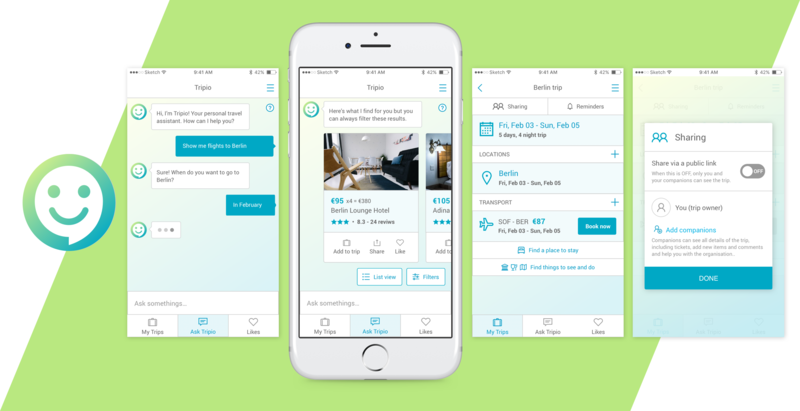 A mobile app that keeps all your travel plans organised in trips, saves your liked places and flights, and of course, features Tripio who finds things for you and gives you useful reminders. Online survey was sent to the general public and the results were filtered to analyse responses from the target group of users who are 18-34 years old, travel 5 to 10 or more times per year and have taken 7 to 10 or more flights in the last 5 years. We will call these frequent travellers. 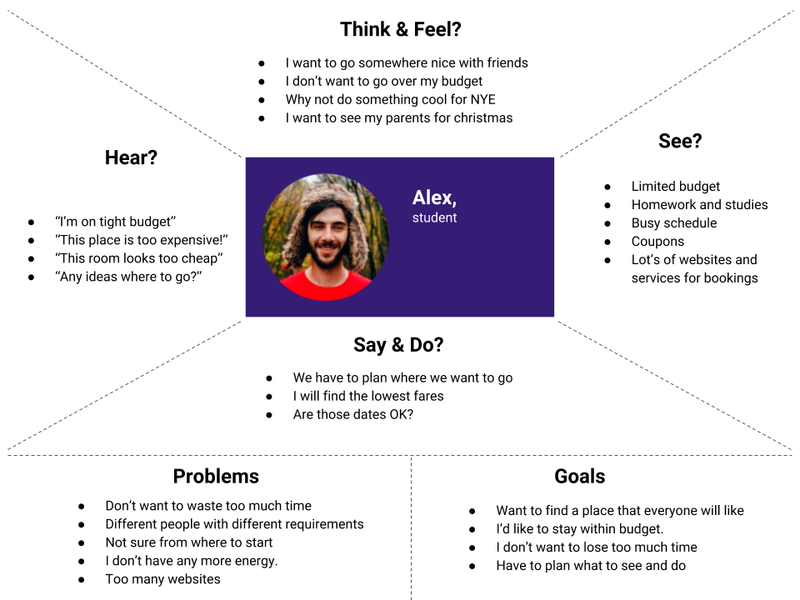 76% of that target group use online services and apps like Booking.com, Airbnb and Trip Advisor, to book tickets and accommodation and learn useful information. The survey also helped identify the main reasons for travelling of the frequent travellers. These include visiting friends and family, business, exploring places, nature and sightseeing. 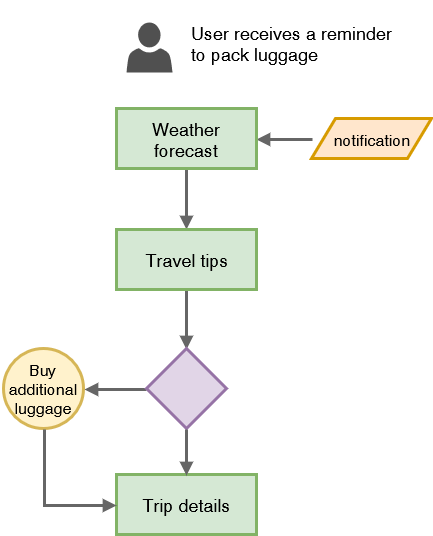 Those outlined the main scenarios and motivators for travelling and the process that follows after the initial idea and the following decision making process. After announcing Messenger and Skype bot platforms, we can see a rise of the number of chat bots that offer different services, e.g. shopping, travel offers, weather alerts, etc. While conversational interface feels very natural in some situation, it’s not always the best or quickest way for the user to interact with a certain service, and chat bots using such platforms are limited by the way they can present information and provide interactions. 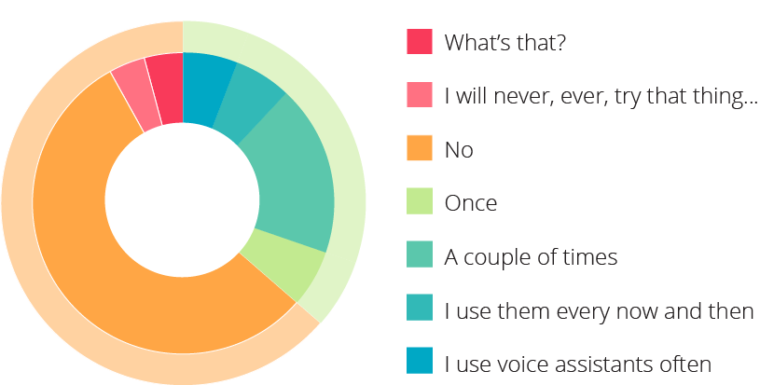 While chat bots are not yet so widely accepted by the common user, voice assistants like Apple’s Siri, Microsoft’s Cortana, Google Now, are more familiar to the general public, however the majority of people haven’t tried them. Only 12% of the survey participants are active users and 24% have at least shown some interest in using voice assistants. Do you use voice assistants? These results on it’s own didn’t explain why not so many people use voice assistants and chat bots. That is why interviews were better at explaining exactly what is the reason and digging in deep into the topic. The reasons varied from privacy issues and frustration to not seeing the benefit or simply not being aware how to use them. At the same time when asked what apps the interviewees use most often, the answer always included messaging and social media apps at first place, which means they were definitely using chat functionality a lot. They just haven’t used a service that makes use of the benefits of conversational interface. Other goals of the interviews were to identify pain points in organising a trip. It turned out that a lot of people usually share very similar problems. 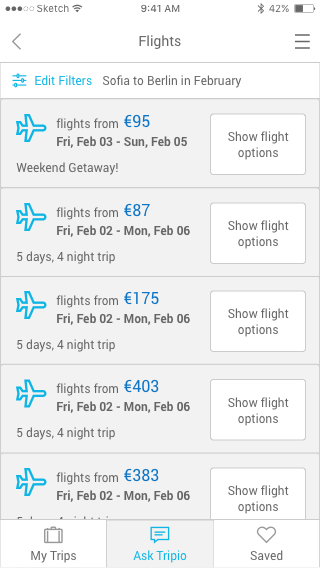 The most time consuming (and often unpleasant) part of organising a trip is choosing and booking tickets and accommodation and coordinating those with other people if they travel as a group. Also choosing the destination and dates prior to that, and planning what to see and do when reaching the destination, which is one of the most selected reason for travelling – exploring new places. That is why the app also needs to engage the user with suggestions when needed. 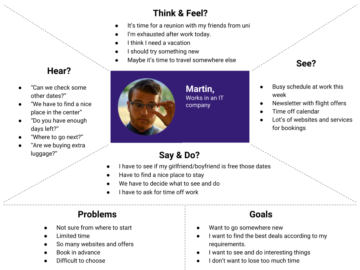 Results from the survey and interviews helped create empathy maps and shape up 3 personas. 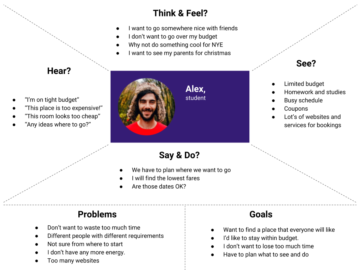 Those personas helped keep the focus and priorities and continue further with creating user flows. You can learn more about them from the images in this section. As I said, personas help keep focus and give identity, but sometimes these identities create borders. 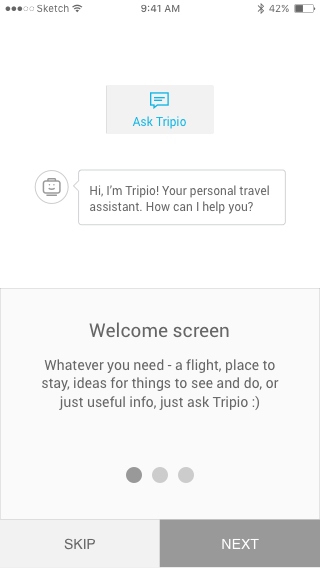 So I would say that Tripio will be for the people who want to have an app that keeps their travel plans easily organised. 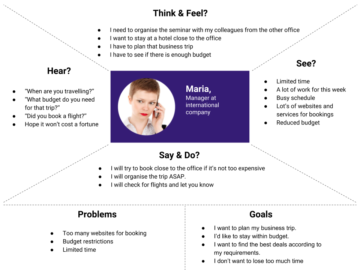 From buying tickets to creating a list of things to do and sharing everything with your travel companions, your personal travel assistant would be there to help and give you suggestions and on time reminders and directions, without being overwhelming. 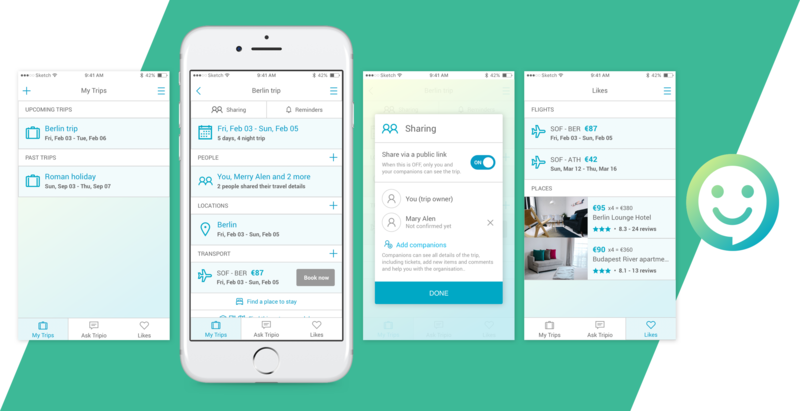 The initial concept for the app suggested two ways of storing user items. 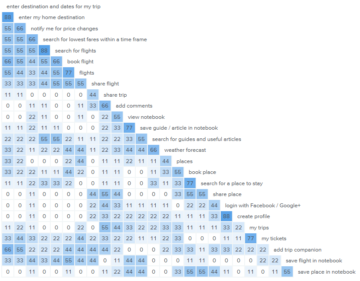 The first one was for organising your trip schedule and keeping all itineraries and details related to it, and the second one for storing just random things you’ve come across – flights you want to keep an eye on, places, guides, articles. When writing the user stories it became very clear that the problem with those two things was the naming convention. The trip organising part was rather easy – simply call it “Trips” or “My Trips”. But there was some hesitation about the other section, whether it should be called “Notebook”, “Wishlist” or “Favourites”. After adding several cards containing the word “notebook” and conducting card sorting sessions, it became very clear that this created some confusion for the participants. While most of them grouped items into sections named “search”, “trip”, “useful” or “itinerary”, there were mixed results with the items containing the word “notebook”. So it was obvious that there needs to be clear differentiation between those two. 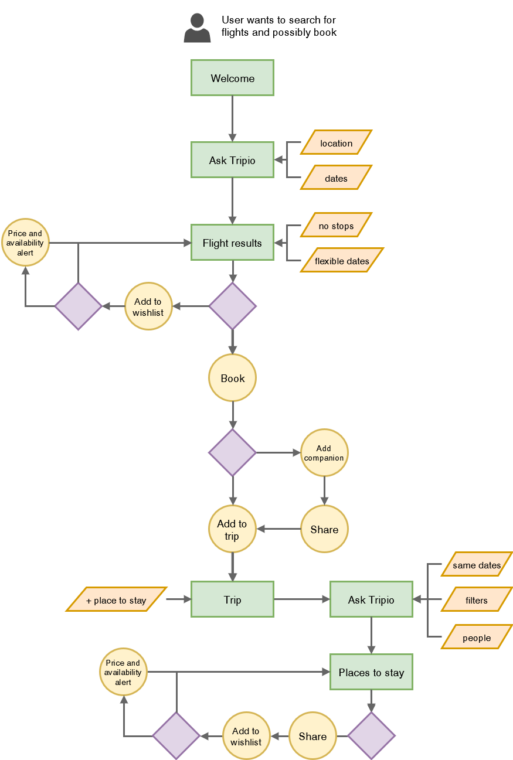 Similarity matrix and dendrogram based on card sorting results. 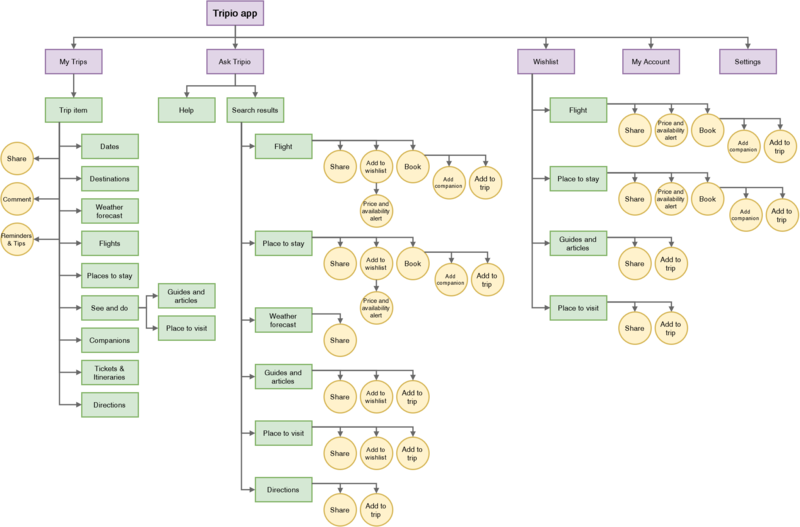 Analysing the card sorting results led to a very good foundation for a sitemap. 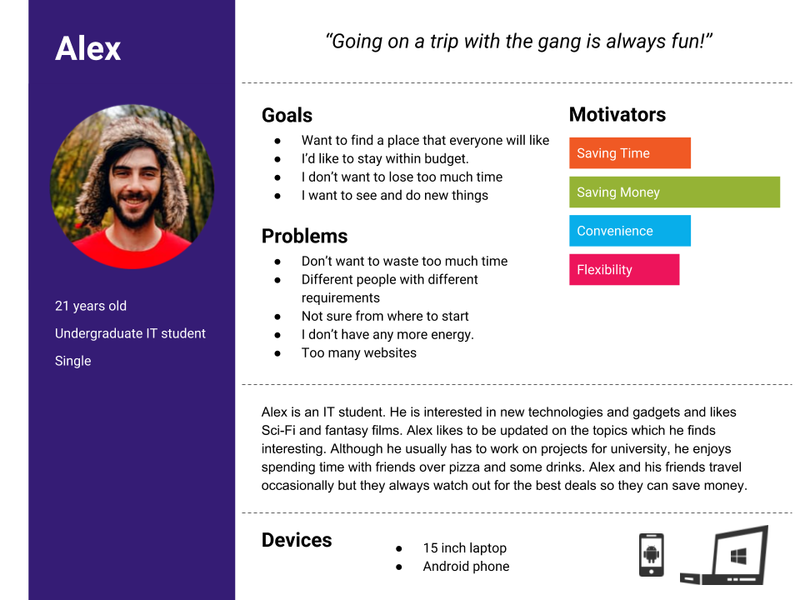 The main goal here was to make the structure as simple as possible so if the app has a bottom navigation with icons, it doesn’t get more than 4 items in there. 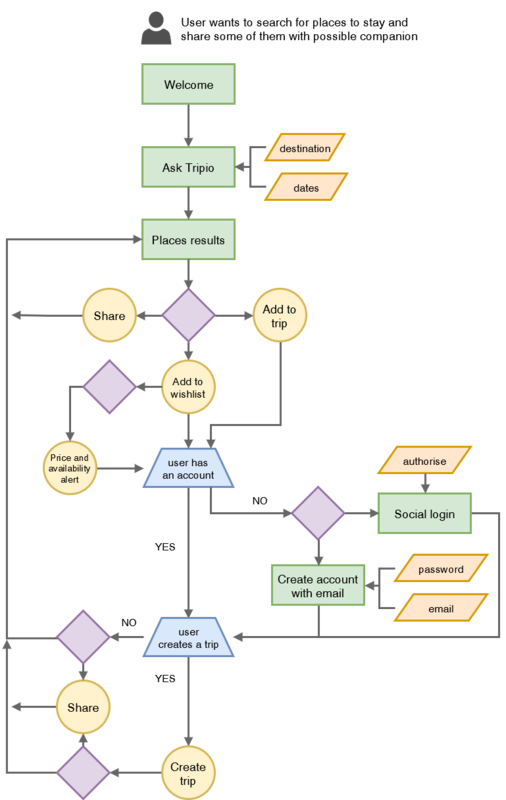 For Tripio app, creating user flows was a vital part for designing it. 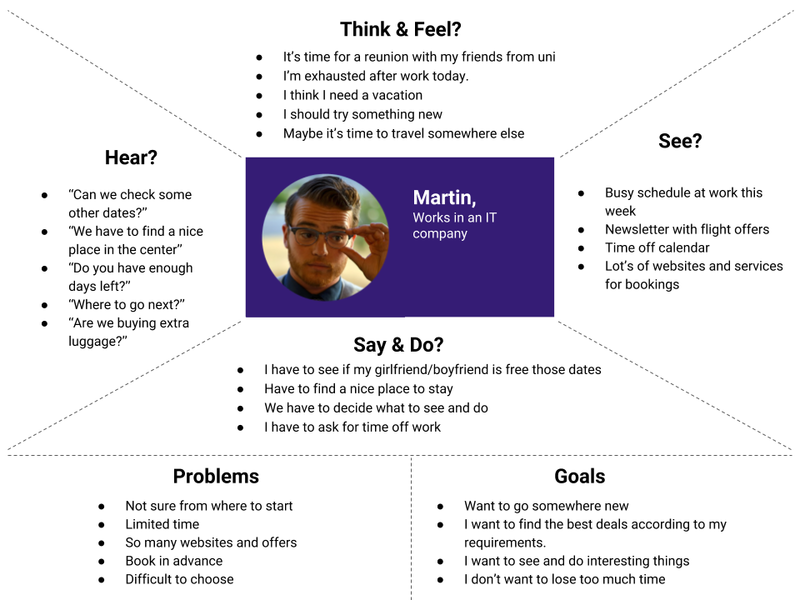 In order to focus on what is important for the users, the 3 personas helped understand the context. Together with the sitemap it made it very easy to figure out possible usage scenarios. 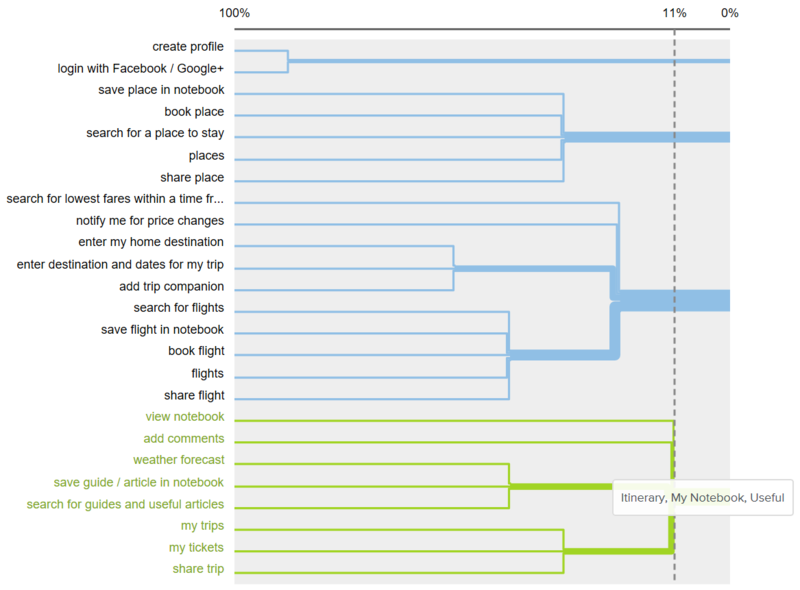 For more details you can have a look at the user flows in this section. The next step was to do some sketches and wireframes, to create the “backbone” of the app and put everything in place. When thinking about travelling, we associate that action with doing it on Earth, travelling around the globe. We are not an interplanetary species yet. That is why for the colour palette of Tripio I chose blue and green. Colours that are very much associated with our planet and nature and at the same time colours that give calmness and confidence. Because the approach for this app and the concept of a bot helping you out is something rather new, lime colour was chosen to freshen up the visuals. A key part of the experience with the app is using a conversational interface and interacting with the chat bot. That is why app logo and chat bot avatar match! Marine Fresh gradient was specially made for Tripio. The shape is a mixture of smiley emoticon and chat bubble, hinting for the chat functionality and giving Tripio a friendly more human like look. Other part of the look includes simple and modern iconography. Icons are outlined, but not as thin as the ones we usually see in iOS. The thicker lines help improve visibility and make the illustrated objects more recognisable. 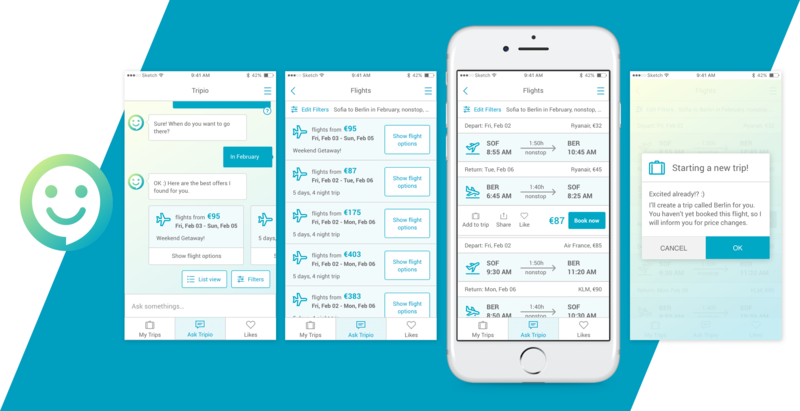 The app’s visual design is bright and clean and aims to focus on the content. Typography, icons and colour highlights help build a simple hierarchy. 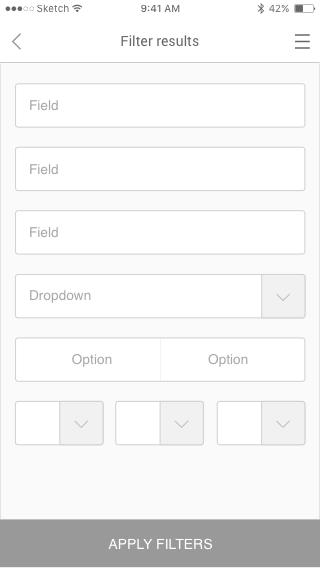 Tripio uses bottom navigation that is now very common for touch devices because it is easy to reach. 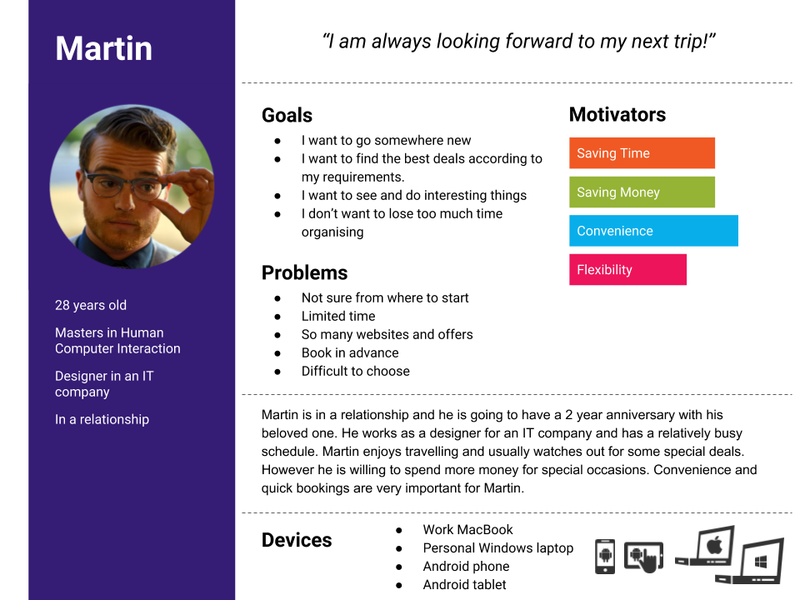 I have used icons combined with labels to make it very clear what the end user could do and find in each section. A hamburger menu icon is found at the top right corner. 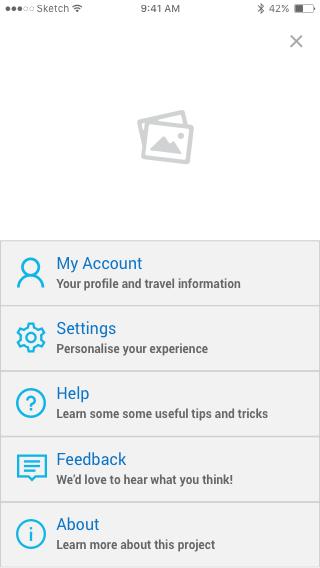 From there the user can access their profile info, settings, help, give feedback or learn more about the app. On the top left corner could be found a “back” button or a “+” symbol to add a new item. There are also other buttons on different screens and they often include icons or are highlighted with colours depending on their importance. 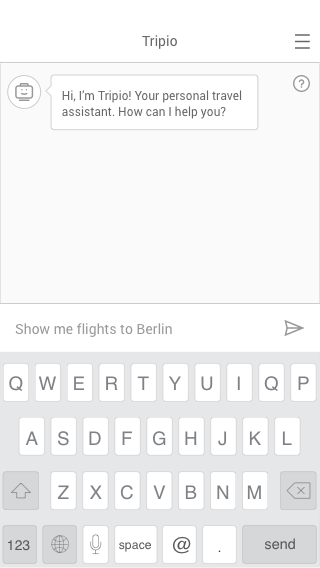 When using the chat interface, Tripio bot returns results as cards which the user can swipe left or right, but there is an option for “list view” which is up and down scrollable and is visible on the entire app screen. 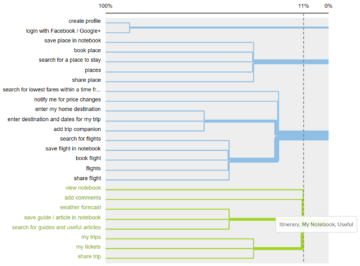 This is made so because this view expands the visible area for results and also might feel more natural for some users. 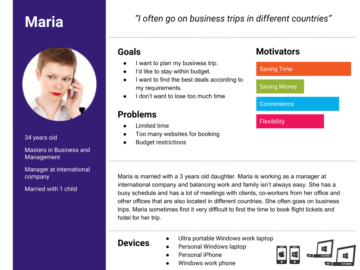 “My Trips” interface uses labeled sections and big icons in order to make the information recognisable and easily glanceable when the user needs a certain piece of information quickly. There you can also find quick links for asking Tripio things such as finding a place to stay, searching for useful information, tour guides and articles. The list can go on depending on context but these are just a few examples. Under this section you can find more screens from the app. After showing the initial prototype and conducting usability testing sessions with target users, feedback was very positive. Users had to achieve 5 tasks and they were completed mostly with ease. Also when asked what they think of the chat bot and the whole process, they all stated it is a novice approach that they like and will definitely give it a try when the final product is ready. In more details, usability testing sessions are a great tool because you can see how users would interact with your product, where they struggle, what they like and what not. This gives you a great insight of what you’ve done great and what can be improved over the next iteration. Here is an example: at the time of the first testing sessions, the section for saving random items was called “Saved” and the action “Save”. This caused misunderstanding what does “Save” and “Add to trip” do and what is the difference. That is why, in order to differentiate those actions, a new naming convention was established, replacing “Save” and “Saved” with “Like” and “Likes”.Other tips were to make filters and quick links from the trip details interface, more visible. 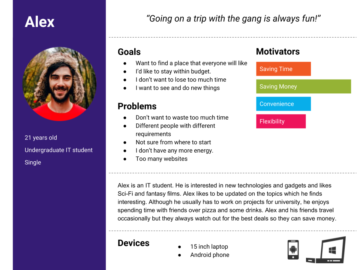 The project idea is to help you easily organise and keep track of your travel plans. There is also a lot more work to enable Tripio giving you the best offers and helping you with just on time notifications and useful information. And of course to create simple micro interactions and animations to make the whole user experience just feel much better. That is why the project is still in development phase and I encourage you to sign up with your email so you know when the product is launching. Anything you want to share or ask?